Good morning ... Situational awareness: Two big health care mergers hit potential stumbling blocks yesterday: California's insurance commissioner is formally urging the Justice Department to block the proposed merger between CVS and Aetna, while activist investor Carl Icahn is trying to stop the merger of Anthem and Express Scripts. If you thought yesterday’s expansion of “short-term” health plans seemed especially controversial, even within the bounds of a debate we’re all very used to, you were right. The big picture: These new rules challenge two fundamental parts of the Affordable Care Act: its minimum standards for what insurance has to cover; and its goal of making those guarantees work by pulling in a mix of healthy people. What they're saying: Democrats accused the Trump administration of “sabotaging” the ACA. HHS Secretary Alex Azar said he had no desire to undermine the ACA, only to provide an affordable option for healthy people already driven out of the exchanges by rising premiums. Quote"The Affordable Care Act is sabotaging itself." 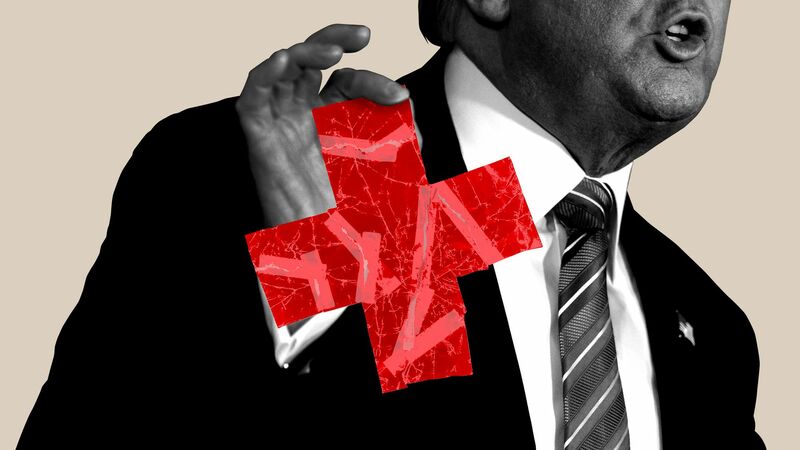 Either way, you end up at the same place: The Trump administration, unlike its predecessor, is not trying to find or create a better mix of healthy and sick people within the exchanges. Instead, it’s relegating the ACA’s markets to the sickest and poorest consumers, and supporting a parallel market for people who don’t think they will need much coverage. Winners: UnitedHealthcare, which is the biggest provider of short-term plans in the country, and brokers like eHealth, whose stock was up more than 9% yesterday. United’s short-term plans paid out 44% of their premium revenues last year for medical care. ACA plans have to pay out at least 80%. Losers: People in the individual market who have pre-existing conditions or who need coverage for services like prescription drugs, but who make too much money to qualify for financial assistance under the ACA. Insurers are raking in money this year, largely thanks to the very large premium hikes they enacted. They'll likely see a profit margin north of 10% on their ACA business this year, up from just 1.2% last year and losses in the years before. The country's highest-grossing drugs are protected by thickets of patents that will shield them from generic competition for years, sometimes decades, according to a new paper from I-MAK, a nonprofit organization that advocates for changes to the patent system for prescription drugs. Patent protection keeps cheaper generics at bay, allowing the brand-name manufacturer to keep its prices high — or even raise them. I-MAK's report is focused on the practice known as "evergreening" — taking out new patents on an existing drug, sometimes for minor changes, in order to extend its protection. By the numbers: On average, the 12 highest-grossing drugs in the U.S. are protected by 71 patents, blocking competition for 38 years. And they've seen an average price hike of 68% since 2012. “We’re giving too much away to pharmaceutical companies and then paying through our nose for it," I-MAK cofounder Tahir Amin said. Some caveats: These totals include all of the patents for each drug — not just the ones drugmakers have obtained after their products were already on the market. Not all post-market patents are evergreening. In some cases they apply to new formulations or important changes — for example, to address a newly discovered safety issue or a new clinical use for the drug. Why it matters: Drugmakers' patent practices are facing tougher scrutiny amid the political push for lower drug prices. Azar called out patent "gaming" in his Senate confirmation hearings, and the industry's critics have also pounced on high-profile examples that were obviously not tied to any scientific advances. An example is Allergan, which tried to transfer a valuable patent to a Native American tribe so generics couldn't challenge its validity. Wall Street had a field day with Molina Healthcare’s big earnings surprise, driving the insurer’s stock up 17% yesterday. But the profit bonanza may not be as clean as the investor community thinks, Axios’ Bob Herman reports. The intrigue: A few one-time moves, particularly to Molina's ACA business, tipped the scales. Molina put aside too much money to pay into the ACA risk adjustment program, so it got to collect $79 million that originally was projected to go to other insurers. Molina raised the premiums for its ACA plans a lot. Per-member per-month premium revenue for all its ACA members went up by 41% in the first half of this year, and that led to a 54% medical loss ratio (page 16 here). The ACA requires plans to have medical loss ratios of at least 80%, so if Molina’s ACA plans continue to hoard cash, the company will have to return a lot of money in the form of rebates. Molina’s days in claims payable (a metric that more or less describes how quickly an insurer pays hospitals and doctors) have fallen by five days since the start of the year, suggesting some previously reserved cash is bleeding into earnings. Sad news from Reuters: Just days after an Ebola outbreak was declared over in the Democratic Republic of the Congo, there’s a new one. Four people tested positive for the disease, more than 1,500 miles away from the location of the last outbreak. The health ministry says there’s no evidence of any link between the two outbreaks. The previous outbreak killed 33 people. It’s the 10th time there has been an outbreak in the region since the virus was discovered in 1976. But also, a thing that lasts three years is not “short-term.” The Korean War lasted three years. It’s been three years (and change) since Donald Trump announced he was running for president. It’s not a short amount of time. We need a new name for these insurance plans. Send your best suggestions to baker@axios.com.